Six years ago the Giants and Patriots played one of the most dramatic championship games in recent professional sports history in Super Bowl XLII. The defining play of the game may have been the most exciting play ever seen in the Super Bowl – David Tyree's helmet catch. The play represented why many fans have ben critical of Buck over the years – a lack of passion and energy and a feeling that he'd rather be anywhere else, like HBO for instance, than calling the biggest sporting event in the world. But after six years, the Joe Buck you will hear calling Super Bowl XLVIII is a much different voice than the one you heard call Super Bowl XLII. Fast forward to this year's NFC Championship Game and listen to Joe Buck's call of Richard Sherman's tipped pass that led to the game-winning interception. I'd love to embed it for you, but the NFL's video sharing policy is even more backwards than Major League Baseball these days. Buck's call of the Sherman play is everything his Tyree call wasn't – energetic, forceful, and capturing the drama of the moment. With that, the perception of Joe Buck is changing. He used to be known as the anti-Gus Johnson and one of the least favorite announcers of the blogosphere. Now, he's found a fantastic balance between being an understated, classic play by play man and someone who can get up for the big moments. A couple years ago, you would easily find Joe Buck's name trending on Twitter during a football or baseball game because of detractors of his announcing. These days, Buck is more admired than reviled as an announcer, even by those who were once his critics. In truth, each of the networks' top announcers are all very talented. Although it would be nice to see fresh faces being given more opportunities, the top-line announcers of Jim Nantz, Michaels, Mike Tirico, and Buck all deserve respect for the jobs they do week in and week out. Just looking from afar, there appears to be a couple reasons for this change in style from Joe Buck. First, Buck joined Twitter a few years ago and immediately began interacting with fans and detractors on a forum that always hasn't been so kind to him. He poked fun at some of the biggest bombs that have been thrown at him over the years (nepotism, Fernando Tatis, Artie Lange) and showed a different side of his personality. Even though he hasn't tweeted since October, perhaps he saw enough to be willing to change gears. Secondly, there seemed to be a noticeable change in Buck's style ever since a virus in his vocal cords affected his announcing in 2011. For several months, a hoarse Buck soldiered through the MLB regular season despite the ailment that negatively impacted his broadcasting ability. Thankfully, the virus subsided and Buck is back to full health. "When you get into it as somebody's kid, and you're around it your whole life, it just kind of seems like second nature," Buck said Sunday. "But when the idea of it is hanging in the balance or you feel like it may be taken away from you, you start thinking, 'My God, I really do love what I do.' I'd rather work than not work. I'd rather do a game than not do a game." Another moment that cemented my personal change of heart about Joe Buck was the call for David Freese's walk off home run in Game 6 of the 2011 World Series echoing the call of his father Jack Buck, "we'll see you tomorrow night." At first I was hoping the younger Buck would deliver a call of his own, but the endearing tribute was pitch perfect. From then on, I've found Joe Buck to be a much more enjoyable and enthusiastic announcer. With a new partner for next year's MLB season, it should be a fresh start for Fox's baseball coverage and fans of that sport should begin to warm up to Joe Buck just as football fans have in recent years. 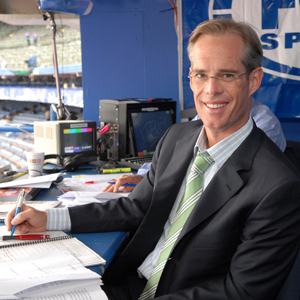 Joe Buck has been Fox's lead play by play announcer for the better part of almost 20 years and has been their top NFL voice since replacing Pat Summerall for the 2002 season. At just 44 years of age, he's going to likely be around for another 20 years as their top announcer at least. As he prepares to announce his fourth Super Bowl for the network on Sunday, I'm actually looking forward to his call of the game along with Troy Aikman. It's a testament to his willingness to be more energetic in his delivery even though his status at the top of Fox Sports was set in granite a long time ago. As we look ahead to Super Bowl XLVIII, it's time to stop worrying and finally embrace Joe Buck, America.